Office of Technology Management and Commercialization (OTMC) serves as an educational and management resource for UNO's Intellectual Property (IP). We are responsible for the evaluation, protection, and efficient transfer of IP to the marketplace. A step by step overview of the process: from research, to licensing and on to commercializing. We welcome your interest in the University's research, know-how and technologies. We look forward to partnering with you to bring to market our innovations. University innovations can help you gain competitive advantages, but due to their early stage, generally require additional investment and development. 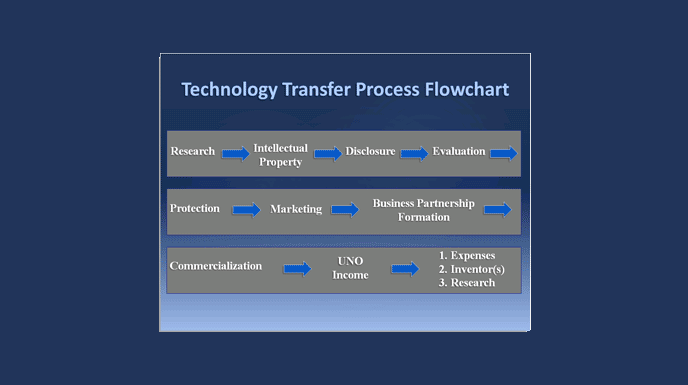 OTMC manages the University's intellectual property from Technology Disclosure to licensing, and manages the transfer of University research to industry. Additional information is available in Information for Companies. As researchers and employees at the University of New Orleans, you develop discoveries that are significant to academia, the business community and the public. Much of the knowledge you develop is disseminated through publications and papers. However, before any public disclosure of your idea or invention is made, it must be protected if it has possible commercial value. Otherwise, any income from your idea or invention can not be assured. Please note that in accordance with the UNO policy (AP-RE-03.2 Intellectual Property), you are required to report inventions, discoveries, and other developments having possible commercial value. Additional information is available in the sections titled For Researchers and FAQ. Please do not hesitate to contact OTMC if you have any questions.